I wasn't sure I should post expenses we had for our trip south as parts of it seemed a bit confusing, with it not being a full month. We left October 12th from Canada so had gas and propane expenses for the Canadian portion till we hit the border, but as well, our tank was almost empty from the last trip, so we had a fill on that. So, based on all that, I decided to give our expenses from the time we hit the USA border, till the time we arrived here in Arizona. Expenses based on October 13-October 31...in US dollars. 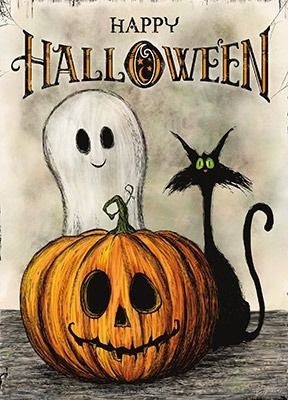 Halloween party today/ tonight? You still have time to whip up these Last Minute Witch Finger Cookies from Krusteaz. 1//In a large bowl whisk together cookie mix pouch and flour. 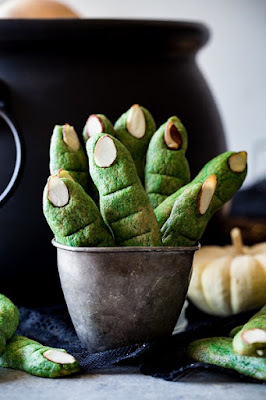 2//Add butter, egg, and green food coloring, and stir until combined and dough has come together into a ball. 3//Roll dough into 1-inch balls, then roll each ball into into 5-6 inch "fingers" -about 1 inch thick. 4//Firmly press one sliced almond into the end of each finger to make nails. 5//Slightly pinch dough together about 1 inch below the almond nail to make the knuckles. 6//Make a horizontal cut in the center of each knuckle. 7//Place fingers on a cookie sheet 2 inches a part. 8//Place cookie sheet in freezer for 15 minutes before baking. 9//Bake at 350 degrees for 11-13 minutes or until the edges turn golden brown. 10//Cool for 5 minutes on the pan then transfer to a wire rack to cool completely. A bit chillier out here in the desert today and with no trick or treaters. But kinda miss it. We are all "settled" into our little desert corner, till we leave again to go see the girls in Las Vegas, mid November. Yes- both of them are flying in so we'll make the drive and go see them for a few days. I got my mail all set up again here in Arizona- and another 6 months costing me $60. It took us 13 days and 2750 miles driving to get here. 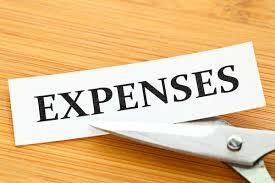 Still have to do my expenses perhaps tomorrow to figure our gas, food and other expenses for the month- so stay tuned. I do know gas was alot more expensive driving through Canada till we hit the US border than it is in the USA. If your looking to really treat your hair as I was- look no further than Amino Mason MOIST for Intense Hydration. Out here living in the desert for 6+ months of the year and having 50+ year old hair on top of it, I need to baby my hair. 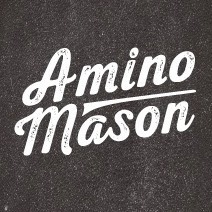 Amino Mason has a wonderful product line . Amino Mason blends plenty of amino acids and forest botanicals to create silky smooth, wonderful hair. It hydrates, it heals and it protects what I have. I found a new friend with Amino Mason Moist! An early Mormon settlement , audio witnesses the trials and harsh condition the people faced, carving out a pathway for their wagons to arrive at Bluff. 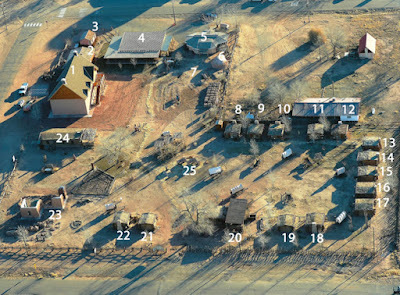 Several families are represented with cabins decorated with furniture, household articles, linens, photos, books and letters donated by the descendants of the original families. Their everyday lives are shown with the wagons, well, water wheel, meeting house, school room, blacksmith etc. Spent an hour watching some planes doing some fancy maneuvers just outside the Lake Havasu City, Arizona Hanger 24. This was their 2nd annual Airfest. It was so hot out today - that that was long enough for us being out in the sun! Bring the bliss of a spa experience into your shower with Softsoap® Hydra Bliss Hydrating Body Wash. The newest additions to the Softsoap® Body Wash Portfolio are crafted with rejuvenating scents like cucumber water, mint, coconut water and blueberry. We love these scents since they are non floral, which is great for us because we both can use them! We have always been a fan of the Soft Soap hand wash and their body washes, finding they work equally as well for men or women. These hydrating formulas help retain our skin’s natural moisture, leaving our skin feeling soft and smooth. Plus if you love them in the shower, the same wonderful scents are available in hydrating hand washes as well. Researching a car before the even taking a look at in person is an important part of any car purchase, and it’s especially more so when we’re talking about used cars. When you’re actually talking about a car that you intend to own, it’s not all about reviews, ownership plays a major part too. Thus, there are some tips that you should acknowledge to help you better utilize your time researching any used car models. First, you should know what car you actually need. Think about this holistically, and it’s also prudent to prepare for the future. How many passengers do you need to seat? Is it a car for grocery runs? Is it supposed to be a working vehicle? Do you want a toy for the weekend? These are all questions you should ponder on before looking for cars. For example, if you’re planning to start a family, an MPV may prove to be more suitable. Once you have a vague idea of what you want, you can then begin to look for a broad range of used cars you need online. If you have a more specific need, like a comfortable ride and roomy cabin, begin to search for car reviews and skim to the review verdicts. These will generally include the pros and cons of each vehicle and provide you with a robust predicate to work on. Also, you should also know what features and amenities you want in your car. Things like an infotainment system, climate control, sunroof, advanced active safety features, leather seats, etc. These will also affect the cost. Some features are sought after, so it’ll be worth the trouble looking for a well-equipped car just to boost the resale value. This is perhaps the most important rule that you should abide by. Set a budget and ensure that you stick to it religiously. For used cars though, it’s not an absolute rule that you should adhere to since it’s at times beneficial to be able to stretch your budget a little. If there’s a trim or even another model that’s more appropriate for your application or even if you like it more, it might just be worth the extra cash. Shopping around car loans for people with bad credit can take even more research. If you think that you’re someone easily influenced by sweet talks from the salesperson though, or even if you’re someone that’s a bit overenthusiastic in your shopping, bring a rational friend or family along with you that’ll gladly pull you out of it. Crucially, ensure that you take into account the ownership costs. You have to actually take care of the car after buying it, and that means maintenance, fuel and major repairs. Also do take note that as fuel prices rise, a fuel efficient vehicle is becoming an increasingly valuable commodity, and thus will generally be able to retain their value better. When you know what type of car you want and have set a budget, you can begin to narrow down the list to a few cars. Once you have done so, you can start searching for information online. One of the most important resources that you should always leverage, especially for used cars, is online documentation of the vehicle. Also, try to understand what trim packages are worth it, and what isn’t. If it’s a popular car, or even a particularly niche car, it will have an owners’ club or forum online that you can use to know how it's like owning the car. You can know the defects and flaws that you should look out for too. In fact, it’s likely that you’ll even be able to find a buying guide online that can give you important pointers to guide you through your purchase or getting a car loan in Ontario. This is where you should spend a lot of time on so that you can avoid ending up with a lemon. It’s only 3 basic guidelines that are seemingly simple. However, it’s important that you always keep these in mind whenever you’re shopping for used cars. If needed, you can always go down to your local dealers and check out their inventory, which can aid you to better ascertain the type of car you need. Leaving Flagstaff today we knew we were going to be driving through Williams, Arizona on our way to Lake Havasu City. We had been through Williams once before but hadn't known about Bearizona until I happened upon reading about it in an RV Caravan book. Bearizona is a wildlife park with a drive through and walk through area, featuring many wild animals like wolves, bear, bison, etc in the drive through area and other animals such as otter, jaguar, bobcat, etc. in the walk through. They also feature a petting zoo and Birds of Prey show with multiple show times, which time constraints kept us from seeing this time. Since we love animals- we just had to check it out. Plus, we knew our Jakey could go along and view the animals as well in our SUV- providing windows are always kept up. He loved it! We loved it! And if you want to do the loop again and see the wild animals again, you can drive the loop over and over. There's even a great big gift shop there with miniature train running indoors! There's a place to eat, and even a bar. The place is very clean and the staff friendly! Its a must see stop for families, couples, or singles. Gerry making a face like the grumpy bear! Experience animal wildlife the way it was meant to be, in a natural environment, all from the comfort and safety of your own vehicle. Make sure you stop! Navajo Nation's Monument Valley Park. This is one of the most stunning – and most photographed place on earth. I've wanted to go here for years- finally can say we have! The campground at Goosenecks State Park is primitive but features impressive views of the San Juan River's deep meanders. $10 for the night. Water was pretty dirty down there! Two lonely rock pillars right next to a highway. Kinda look like elephant feet or parts of them! Outside of Tonalea, Arizona. People selling Navajo jewelry while we were stopped there. Decided to leave our RV at the Visitor Centre today and drive through the park with the SUV. What a busy place! Some of the photos I took today. Quite the line up back at the entrance! We had to drive about half way up on this photo. Shop smart and do good this season. Give to the ones you love while giving back with these great holiday gifts. 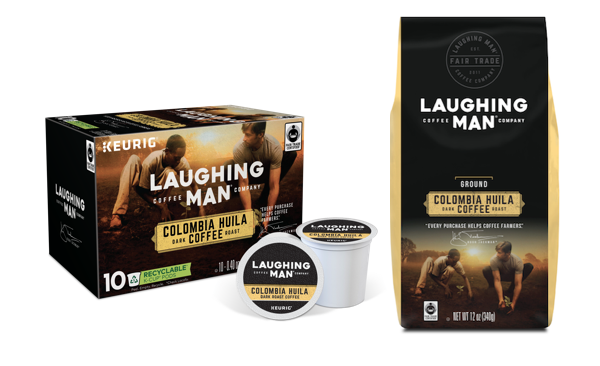 Laughing Man® Coffee was co-founded by Hugh Jackman and since its inception, it has always strived to Make Every Cup Count by donating a portion of sales from each purchase to the Laughing Man® Foundation, which supports coffee farming communities and programs that ensure fair wages, and clear the way to sustainable health, growth and success for coffee farmers and their families. All Laughing Man® Coffee pods in new packaging are now recyclable. 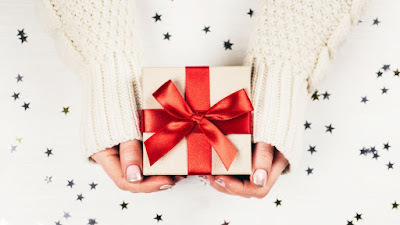 **Watch this spot for more Gifts that are giving back this holiday season. Just like Chevy Chase on his visit to Wally World- we missed the Flaming Gorge Dam Visitor Centre being opened and seeing more of the dam today, by 2 days. I guess the Visitor Centre closed for the season October 16th so the walkway over the dam was closed. Located just outside of Dutch John the Dam is quite the site to behold. Free admission and plenty of parking for viewing. Towering 502 feet above the Green River. and completed in 1964, the Flaming Gorge Dam was built to provide water storage and hydroelectric power. The Dam is managed by the US Bureau of Reclamation and is the major hydroelectric dam along the Green River system.